Helen Dortch Longstreet, aged 80, working as a riveter and assembler in a Bell Aircraft bomber plant in Atlanta during World War II. She really was a remarkable lady!! @War Horse, did you see that? Another puzzle piece to add to her admirable personality! I always found this interesting. With the hour at hand, it would have only been natural for both men to be concerned with his own destiny. Considering what they had to feel was a likely outcome. I'd say I can easily see why Longstreet would have preferred to fight it out. His faith in Grant's paid off. "This is a hard fight and we had better all die than lose it." I don't know exactly when he said this, but I think it captures his tenacity perfectly. The man was not afraid to get dirty, which admittedly got a lot of men killed, but often won the day. But you're here, which is most important! When the war began Longstreet was stationed in New Mexico and, tendering his resignation, did his eastbound journey by land and sea. From Galveston he went to New Orleans by ship. On board of the same he´d meet Thomas Goree, a young Texan who´d serve on his staff throughout the war. Longstreet humorously wrote that their ship, sailing through Union-infested waters, actually was 'boarded' - by a Spanish mackerel that ended as their dinner. 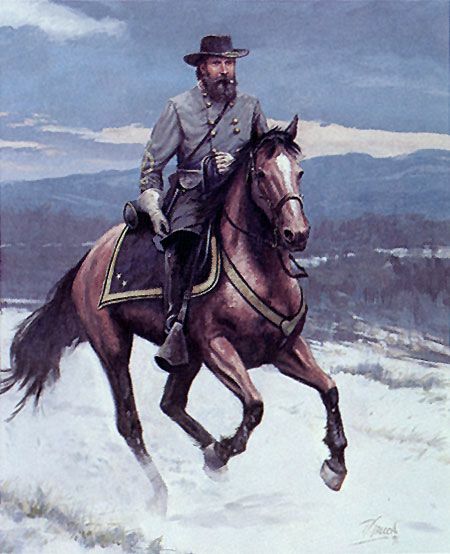 I am very glad on my first day as a member of this site to comment on my secondfavorite person in the way, Longstreet. before the war was superb. I also thought his control of the scene with actor Harrison early in the movie was fine. "What have you got", he says. what cowards and imbeciles they were. left, and had it not been for Thomas on Snodgrass Hill, would havebooted Rosecrans out of Chattanooga entirely. Likes: FarawayFriend, lelliott19 and James N.
How about bringing this thread back for a few little things now and then? There were at least 7 men with the first name James in Longstreet`s West Point class in their first year. A year later they were only 5 and it apparently stayed like this. When they graduated the three lowest-ranking cadets of the class were all named James (including Longstreet). Would give the more reason to post here again. There are so many facts and stories to be found not necessarily warranting a new thread for each so collecting them might work.